Watersheds provide many functions that enrich our lives. 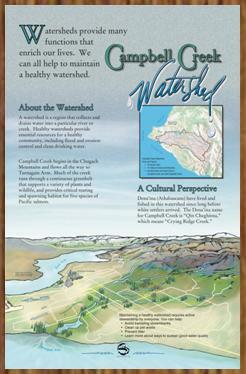 We can all help to maintain a healthy watershed. A watershed is a region that collects and drains water into a particular river or creek. Healthy watersheds provide essential resources for a healthy community, including flood and erosion control and clean drinking water. Campbell Creek begins in the Chugach Mountains and flows all the way to Turnagain Arm. Much of the creek runs through a continuous greenbelt that supports a variety of plants and wildlife, and provides critical rearing and spawning habitat for five species of Pacific Salmon. Dena'ina (Athabascans) have lived and fished in this watershed since long before white settlers arrived. 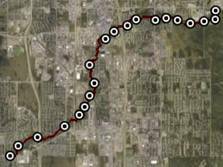 The Dena'ina name for Campbell Creek is "Qin Cheghitnu," which means "Crying Ridge Creek."